Our healing system allows you to customize the way your character heals in several ways, allowing you to personalize it enough to survive the toughest dungeons. 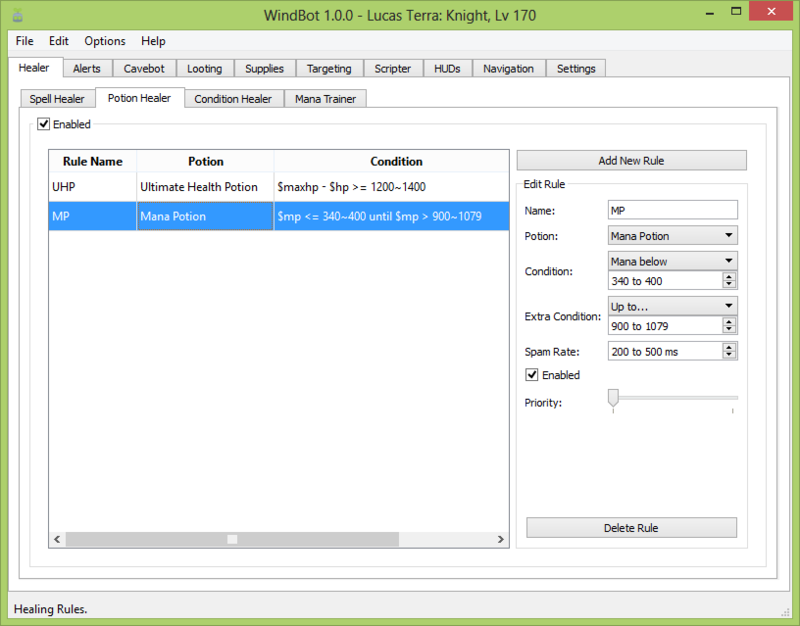 Different healing conditions will allow you to heal at randomized health and mana points. The healer can also start healing at one point and it will not stop before reaching a chosen condition. 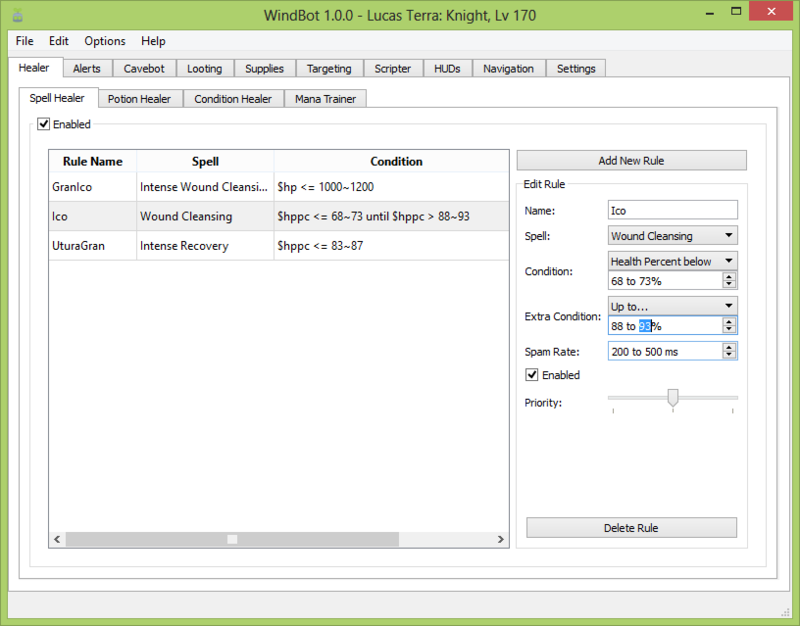 We have 4 different sets of healing rules: Spell Healer, Potion Healer, Condition Healer and Mana Trainer. This way you can use spells and potions at the same time, heal your character from conditions (such as paralyze, poison or burning), or make runes and use spells to train your mana. And much more! The cavebot system is not only easy to use and make paths with. It introduces a new concept for cavebot waypoints: Waypoint Tabs. Each tab contains a list of waypoint nodes, lets you keep your waypoints organized and makes it easy for you to start your cavebot from any position on the map. Special Areas will make your scripts safe by avoiding holes and dangerous areas, skipping a bad path, etc. To extend cavebot's functionality you can add Cavebot Scripts. 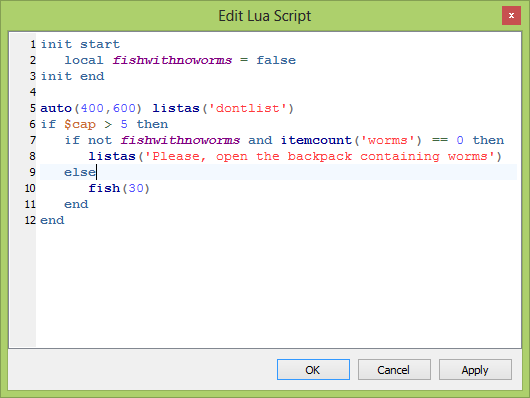 Those are Lua Scripts that will only run with cavebot enabled. We have several types of waypoint nodes: Stand, Walk, Node, Shovel, Rope and others. We also have Action waypoints, which allow you to do things like: open doors, go to labels, deposit items, withdraw cash, etc. 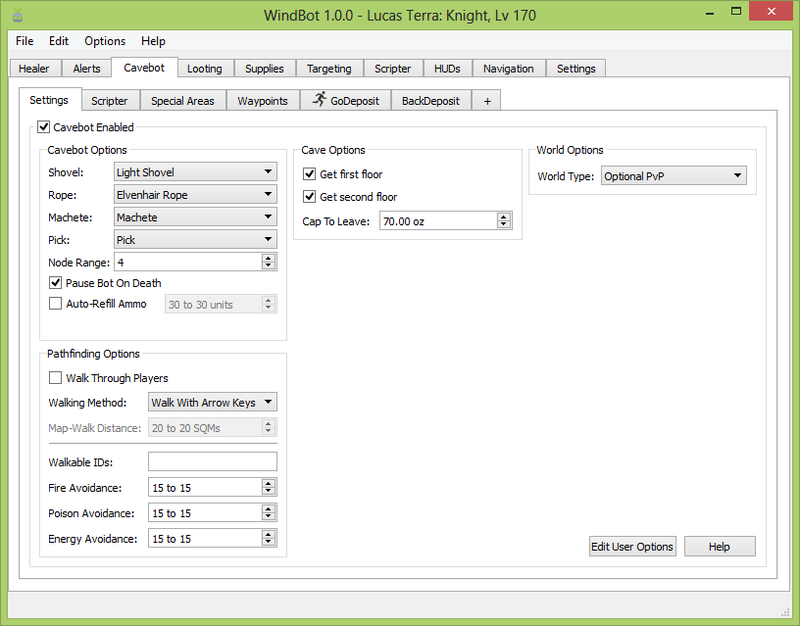 There is also a new feature called Cavebot User Options, which lets you switch custom settings for a script by using widgets like checkboxes, spinboxes and comboboxes. We tested the looting system at the most stressful hunting places: dragons throwing fire bombs, items falling above your loot and several monsters killing you at once. 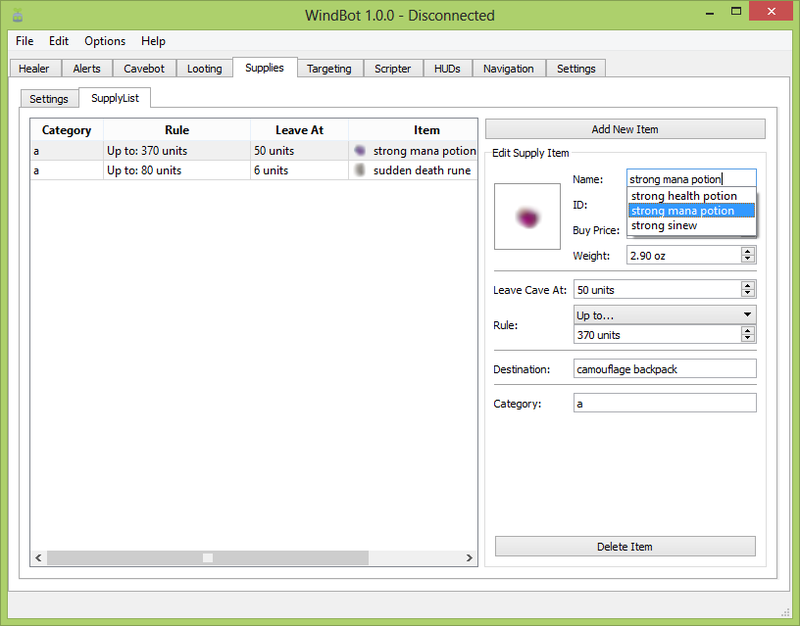 During those tests WindBot managed to loot over 95% percent of the dead bodies! 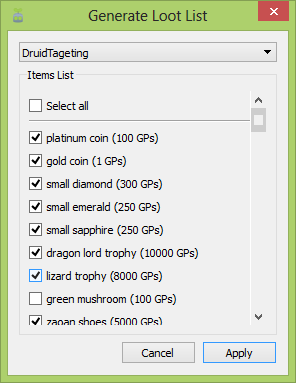 Also, we made it extremely easy to build looting lists, and you can make one in as fast as 3 mouse clicks! 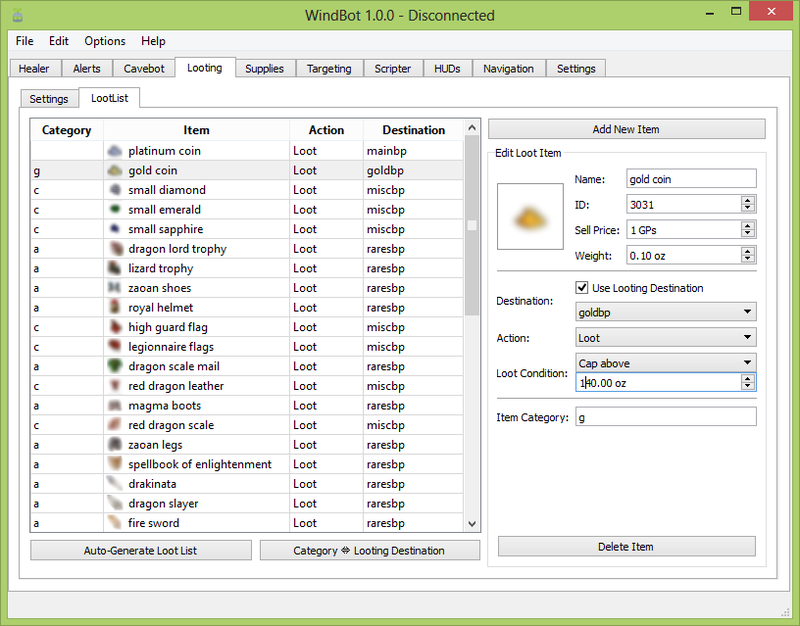 WindBot has a database feature integrated with a customizable set of items dropped by each monster, and the Auto-Generate Loot List feature is built upon that. The bot also has the capability of ignoring not-so-valuable corpses, alert if a rare item was dropped and to prioritize more packed bodies. The never before seen Supplies System will allow you to configure refillers with as little as 2 script lines! You can for example build supplies lists for several vocations and levels. This way, you can quickly switch the supplies configurations for your different characters or hunting styles. Using Advanced Artificial Intelligence algorithms we managed to create a very smart targeting system. You can Approach a creature carefully, avoiding waves and beams. You can Keep Away from a monster, allowing paladins and mages to hunt too. 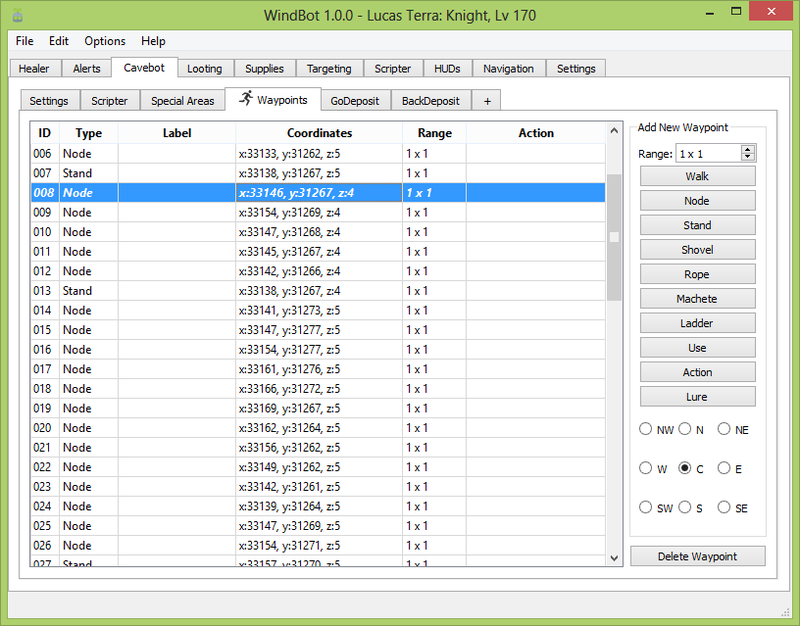 You can Lure a target to a pre-selected spot, making it easy to make 'knight blocking' scripts. We also made Targeting Categories, that lets your character fight several monsters at once using area spells like eternal winter, groundshaker and fire wave, as well as area runes like avalanche and great fireball runes. Different sets of targeting lists can be made using Targeting Profiles. Using it, you can customize your hunting style for several levels and vocations, and switch from one profile to another with a single mouse click! 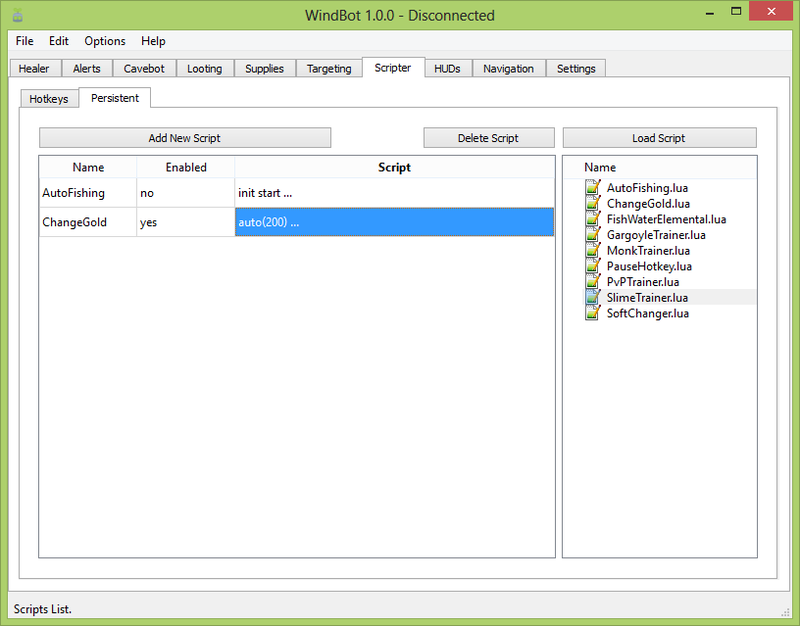 WindBot's scripting system is based on the well-known Lua Language. 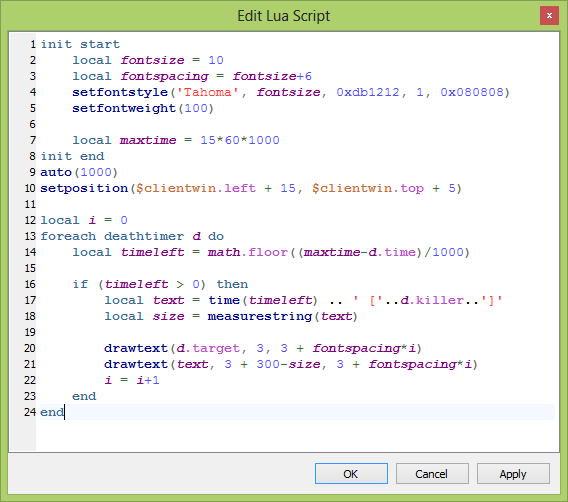 Coding scripts in Lua will allow you to display things on screen, play sounds, operate on files and make the bot emulate almost any mouse and keyboard events. But you don't have to be a scripter to be able to make use of this feature right away. Our community has several good scripters and some professional scripters aswell. 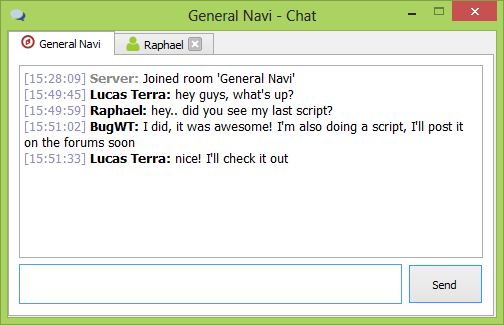 Please visit our Forums to check out our scripts. 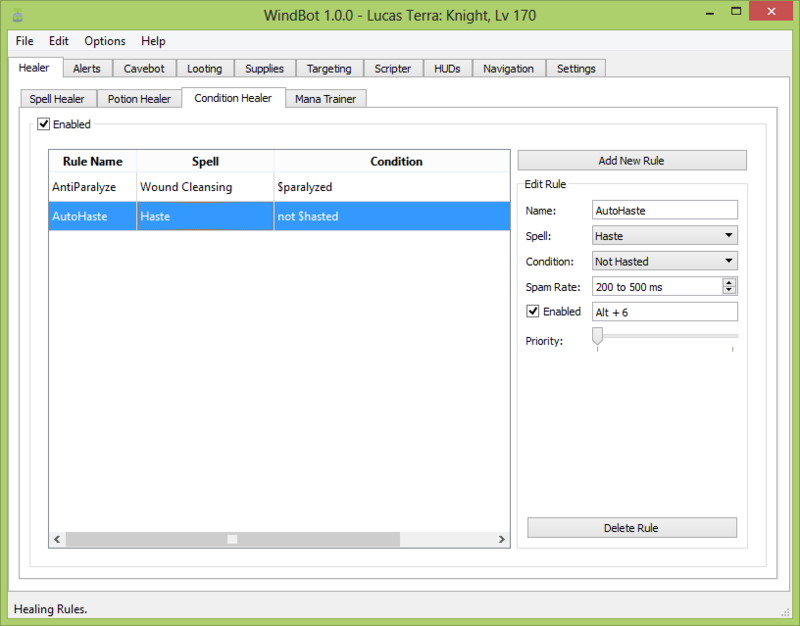 WindBot features a beautiful and extremely smooth HUDs System. You can draw images, rectangles, circles, arc, texts, vector graphics, as well as items and outfits used by the client and more. Using a special type of HUD called the World HUD, you can synchronize rendering of HUDs that are sensitive to motion with the client's frame rendering and it will look like your HUDs are being painted by the client itself! 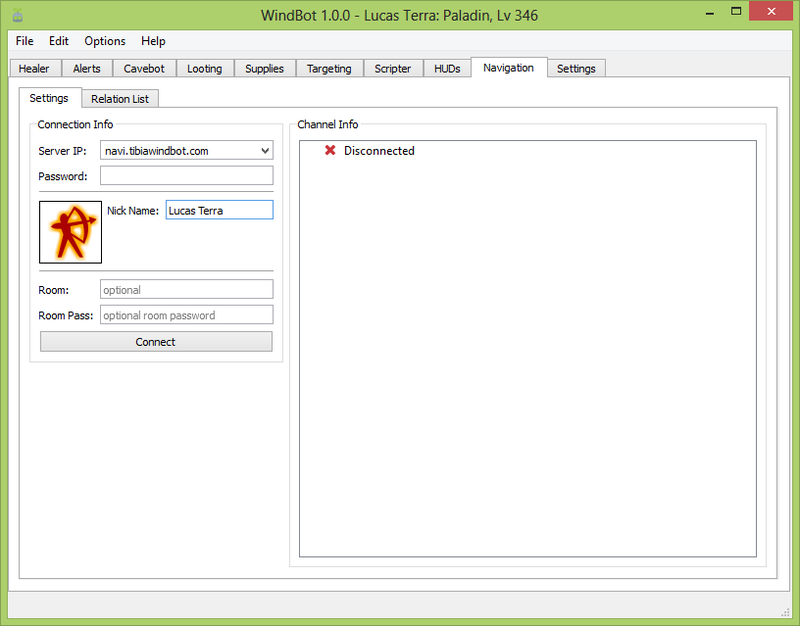 For an example, check PlayerInfo.lua. 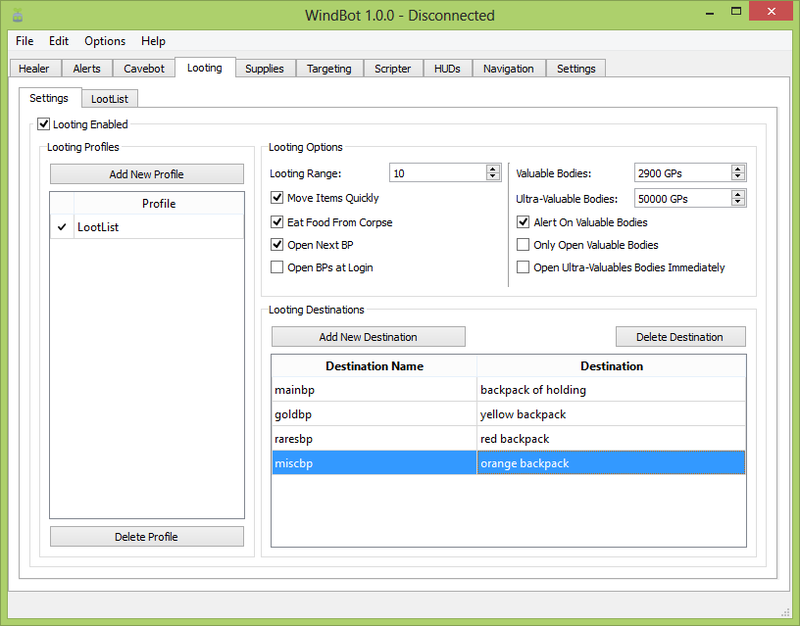 WindBot comes packed with a few pre-made HUDs scripts, like Navigation Radars and Death Timers. But you can also put your creativity into practice and create your own! The HUDs system also accepts several kinds of interaction with the user. Using the Navigation System, you can chat with your friends, exchange files and information, see where your enemies and allies are in the world map in real time, have multiple WindBots talk to each other and much more! 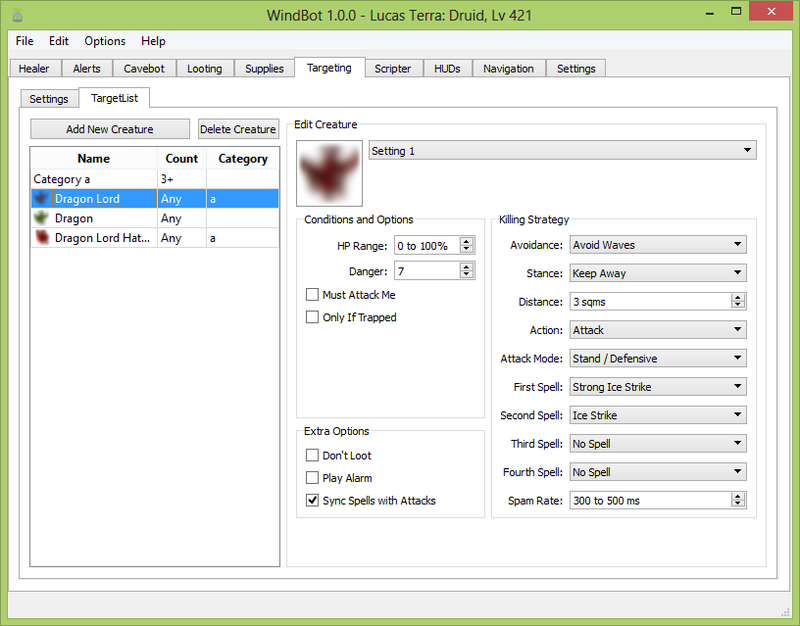 In addition to it, we created an awesome way to tag players as enemies, allies or neutrals. 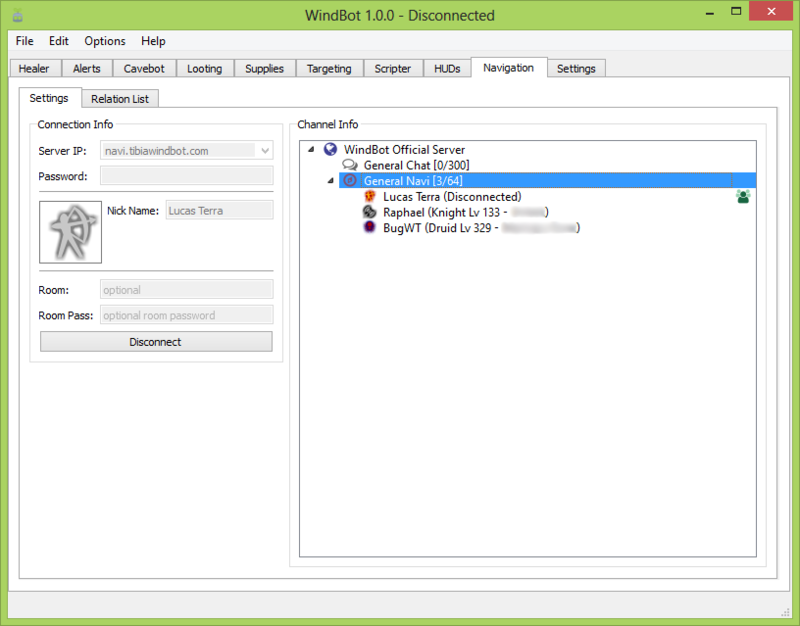 WindBot keeps track of all of your look messages and adds them to a local database on your computer. You can change the relationship between you and other players with one simple click. 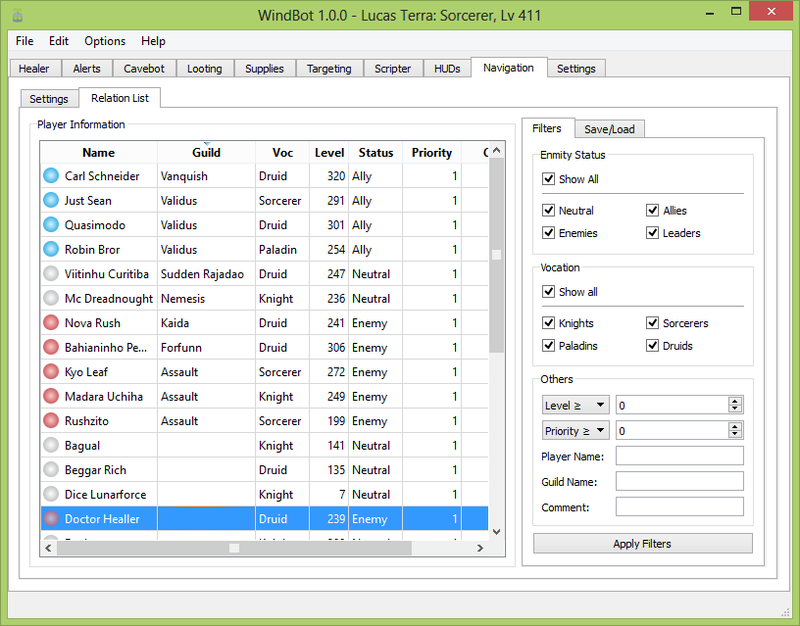 Using Player Relations and Lua Scripts you can develop your own strategies for combat, like targeting selection, friend healing, etc. There are still a few improvements to come, like a centralized database of information about players to see their levels and guild without looking at them and the sharing of such player info by using the Navigation server. 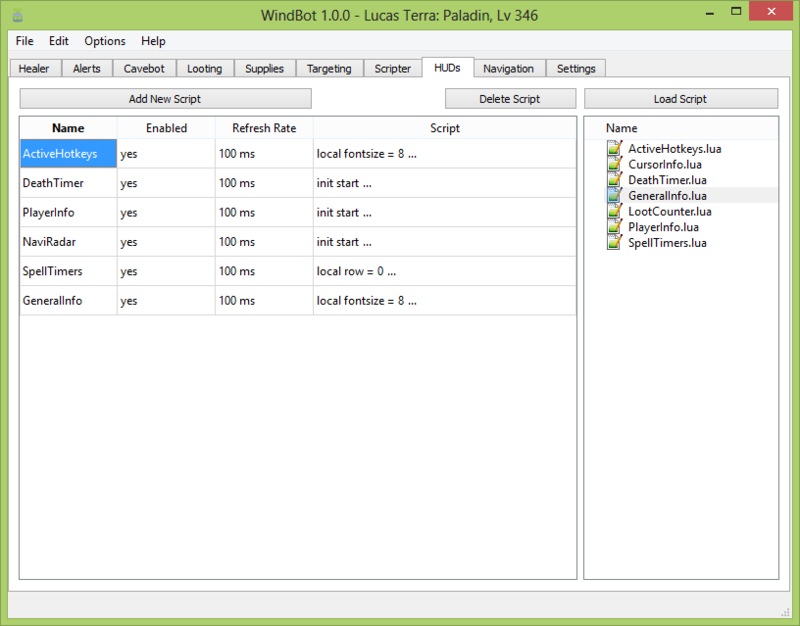 WindBot is a high quality automation and enhancement software that functions alongside the Tibia client. It works by sending mouse clicks and keyboard strokes, displaying it's own visuals on top, facilitating player communication and is customizable in many many ways. Sign-up for news about updates and new features. © 2017 WindBot, Brazil. All rights reserved.